When I was a little girl I used to love to creep into my parent’s bedroom when my mother was busy and open up her lingerie drawer. Inside were all kinds of beautiful, silky fabrics, but what was most wonderful was the smell. My mother would stash fancy soaps among her delicates and it made the contents of the drawer smell like whispering flowers. Then I would peek over the dresser at the mirrored tray that held the exquisitely shaped bottles filled with gold, pink, and amber-colored liquids. On the bottles were printed names like Sand & Sable, Youth-Dew, and Beautiful. I remember watching my mother dab a little perfume on her wrists, neck and behind her ears. I loved hugging my mother and getting a whiff of some blossomy, botanical scent. She always smelled fresh and flowery, like an angel holding a bouquet. Sometimes I would secretly squirt some on myself when she wasn’t looking, so that I could smell like her. Fast forward twenty-five years. I am a mother of five, and my clothes are constantly covered in some sort of human slime. I spend my most of my time cleaning up after dogs and children, three of whom are male. Do I need to elaborate? Sometimes I feel as if my day is just a series of cleaning up different varieties of poop. My room frequently smells like a recently changed diaper. My laundry room smells of mildewed rags, and my garage smells of the cat litter box. And then there is the van, a graveyard of dirty socks and half-eaten bananas. Much of my life as a mom is spent battling one odor after another. I know I am not alone in this, since as mothers, we (meaning our clothes, our hair and our bodies) are literally the catch-all for every type of unmentionable fluid in a variety of viscosities. Our bodies are loved, battered, climbed on, lunged at, and we are our children’s most favorite pillow, punching bag, pacifier, dish towel and jungle gym. Sometimes it feels like our bodies aren’t even our own. But such is our glorious plight: we are not frigid, far-off, oxygen-deprived planets. We are mini Mother Earths . . . giving, nourishing, replenishing, and also getting polluted upon by all the little inhabitants that depend on us for survival. One day I went to help in the nursery at our church. I believe I was pregnant at the time. I was with two other women and we started talking about smells. Good smells, bad smells, intentional smells, cover-up smells. We discussed the scents of different types of gum and finally we concluded with the memories of our mothers’ perfume. Instantly I found myself as a seven-year-old again, opening my mother’s drawer and inhaling. It was then that I realized I hadn’t worn perfume since college. I didn’t even own perfume. And for good reason. What was the point? After you have kids it seems like such an extravagance, and all for nothing. Who is going to smell you? Who is going to appreciate it? No one really cares. Your husband will love you no matter what you smell like . . . right? I chewed on this thought for a couple days. After thinking it through, I went to my husband and made a proclamation. “I’m going to buy something completely frivolous,” I said. Interestingly, my announcement went unchallenged. And I knew exactly what fragrance I wanted. 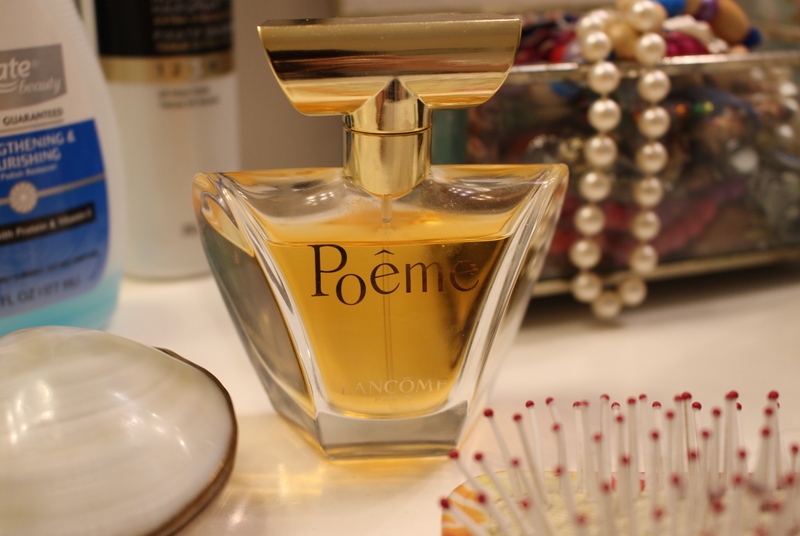 I had breathed it in on a friend several years earlier and when I asked her what it was she said, “Poeme.” Could there be a more peaceful, blissful name? So I went to the fragrance counter in a glittery department store and asked for a small . . . no . . . a medium sized bottle. The woman rang up the price. I gulped. I could buy a lot of things with the amount of money it cost. Several days worth of groceries. Four huge bags of dog food. Three boxes of diapers. I have always prided myself on being a practical person. Scott calls me his “low-maintenance beauty queen.” What was I doing, spending all of this money on something that had no purpose? How had I become so materialistic? I swiped my card. The woman behind the counter put the golden perfume box in a glossy bag and included some free samples of cosmetics. I took the bag from the store, clutching it to my chest wondering if I had just exchanged the family farm for fool’s gold. I am on my second bottle now. I wear it almost every day. Sometimes I catch a whiff of it on my daughters, which makes me smile, and I have my own ways of knowing that my husband does not regret my purchase, which makes me smile even more. But mostly it is for me, to help me–as the cleaner of children and dogs and toilets and garages–to feel at the very least human, and at the very most a beautiful one. Every mother needs something that makes her feel human. When your world is in constant chaos, when every day is just a repeat of the last, when you wonder if you have accomplished anything of worth, and when your efforts in civilizing the next generation are shredded like cheese in a grater, you need to have something within your control. You might not be able to control the wild little primates around you, but you can still lift yourself up to some level of refinement, with the hope that eventually the primates will evolve and follow your example.